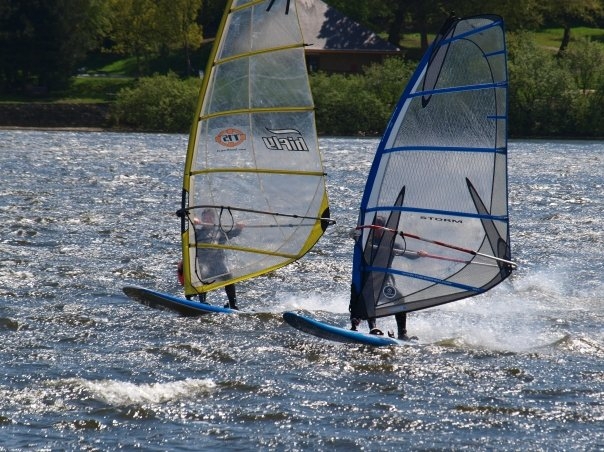 Hollingworth Lake is a popular venue for windsurfing due to the good clean winds and a large water area. We have a wide variety of boards and rigs to meet the requirements of all windsurfers from beginners to those working towards instructional qualifications. All of our windsurfing activities are run to the guidelines and recommendations of the Royal Yachting Association, the governing body for windsurfing in Great Britain. Start Windsurfing Level 1: Saturday 14/Sunday 15 April, Saturday 12/Sunday 13 May, Saturday 7/Sunday 8 July & Saturday 15/Sunday 16 September. Intermediate Windsurfing Level 2: Saturday 9/Sunday 10 June & Saturday 27/Sunday 28 October. Youth Windsurfing Stage 1+2: Saturday 21/Sunday 22 April and every Monday and Tuesday during the Summer Holidays. These sessions are for beginners who want a taste of windsurfing and for those working towards a qualification. Junior Windsurfing courses run during the school holiday. For further information follow the link to the The Royal Yachting Association national governing body website for Youth courses. Adult Windsurfing courses run at weekends. The Beginner course covers basic skills such as windsurfing upwind and downwind, tacking and gybing, up hauling, rigging and wind awareness. The Intermediate course gives people the opportunity to develop their existing skills and knowledge and follows the up to date RYA syllabus including using a harness and beach starts. For further information follow the link to the The Royal Yachting Association national governing body website for Adult courses. These sessions are for windsurfers with a qualification who want to continue to gain instruction each week to improve their skills. Whether you’re looking to start out in Windsurfing or looking for top tips on how to improve, you can book a private lesson for one person or two.